Besides mint and chocolate, another perfect match to me is orange and chocolate, especially with dark chocolate. And I absolutely love these cookies. The recipe originally features white chocolate chips instead of dark chocolate chips, but with dark chocolate chips on hand, I substituted the white chocolate chips with them, plus I like dark chocolate chips more anyway. :p I still cut the sugar (which I’m glad I did!) and baked them to soft cookies. Preheat the oven to 190 degrees Celsius. Beat the butter on low for 30 seconds then increase to medium and gradually add in sugar and beat till creamy, total 6 minutes. Beat in egg, orange zest and vanilla essence. Scoop the batter by tablespoonfuls (or roll into balls and flatten) onto a non-stick baking sheet 5 centimetres (2 inches) apart. Bake for 8 to 10 minutes. Cool for five minutes on baking sheet then transfer the cookies onto a rack to cool completely. 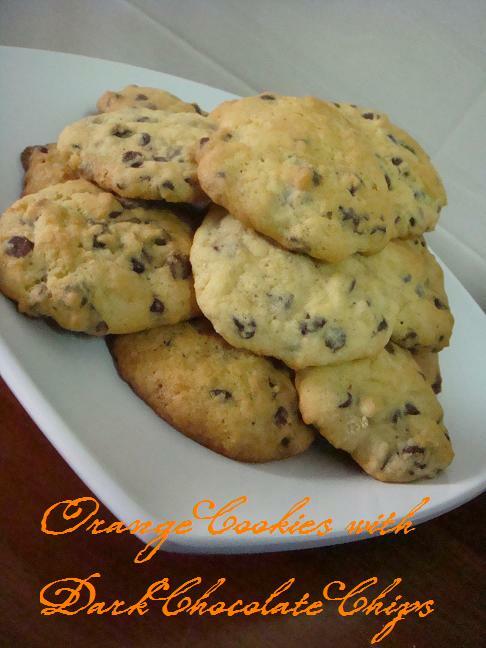 Store cooled cookies in an airtight container for up to four to five days. On a side note, I’ll be once again on a hiatus (break) due to my examinations. I baked a strawberry cake recently but I’m going to reattempt it again before I post it here. I’ll still be back occasionally (maybe?) to post some random notes and things but I probably won’t be baking anything until exams are over. So till then, à bientôt! I HATE YOU JASLINE NG!